This target was photographed this weekend posted on the 50 yard rifle range. Do you see the problem? Please do not post any targets so that you will be shooting through the wood target mounting posts and rails. There is lots of cardboard available stacked by the clubhouse, so please use it! Mount the cardboard between the wood rails, and then mount your targets to the cardboard so your shots will not impact the wood. We all understand that sometimes an occasional shot may hit a rail or post, but mounting a target as shown above, where most of the rounds will hit the wood, just causes unnecessary damage and expense for the club, not to mention annoying everyone else who knows better. 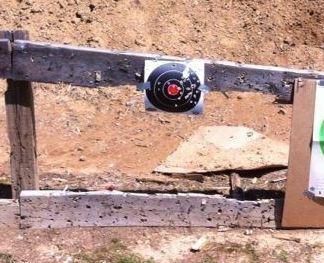 Mount your targets correctly – don’t be “That Guy” that screws it up for everyone else!! If you need any additional explanation, please see our Target Mounting How-To Page, or ask a club officer or member to show you the correct way.